James and I have yet to decide 100% on a goal area for next summer. I’ve floated Rainier and the Grand Teton because I want to see how I do up around 14,000 feet. Rainier would have some interesting mountaineering challenges, whereas the Tetons have more technical climbing. We also haven’t even realized that we could go to Europe to climb in France or somewhere else cool (shh, don’t tell James), so this may change again. In any case, the training right now is the same. I’ve decided to deviate from last year’s approach (periodized, block training) in favour of a concurrent program I gathered from reading a book called The Hybrid Athlete by Alex Viada. Viada likes to train for ultra-marathons and powerlifting at the same time and apparently does pretty well at both. The crux of his approach is that you can train various energy systems concurrently if you do a good job of managing recovering. This is accomplished via programming each week so that similar energy demands don’t fall on concurrent days. For example, a person could train strength on Monday, base cardio on Tuesday, strength on Wednesday, tempo cardio on Thursday, technique day on Friday, day off Saturday, long run Sunday, and repeat. In this way, theoretically, you never overload any of your systems and can create gains in different areas of fitness without the need for block periodization. A key component is to make sure that no workout goes to failure. No more 2 hour sessions in the gym, no more ‘climb till your fingers explode,’ and none of the ultra-long volume days that I had in the last session. The book also encourages to only include exercise modalities that are directly applicable to your sport. So for me, squats are in but olympic-lifting style moves are out. Yes, cleans are fun and develop power and quickness, but aren’t directly related to climbing so put an unnecessary burden on recovery. It’s a focused, minimal approach that I’ve really enjoyed thus far. Squats, weighted pullups, a pressing motion and a hip hinge. Right now I don’t have access to a bar so am using my kettlebells to full effect, combining different sized bells to do front rack squats. 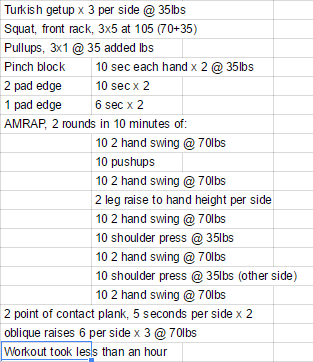 This is surprisingly hard at 105lbs, with a 70 in one hand and 35 in the other. I’m used to back squatting over 200lbs with a bar. Without deadlifts, I’ve been programming heavy kettlebell swings in with my 70lb bell. I’ll likely purchase a 48kg bell in the near future. All lifts are 5 reps or less per set. I’m using my hangboard and pinch block. I’m deviating from the RCTM approach we used last time, which focused on maximum effort for a short period of 7 sessions. I’m instead playing a long game, with few workouts per block and minimal volume, only overloading by a small percentage each week. The rationale is to a) avoid injury and b) leave something in the tank after each workout so that I can still go climbing. I have also been bouldering again. Similar to the ‘limit bouldering’ workouts suggested by the RCTM, I go to the bouldering gym, warm up for 20 minutes, make between 5 and 10 all out efforts on very hard problems, then leave. Slow runs at less than 70% of my max heart rate. This means I stop running and start walking if it goes over 140 bpm. My ratio of run/walk has been improving as my fitness improves (i.e. I can maintain a slow run for longer at a lower HR). I increase time spent running by ~10% each week on one of my runs. I do a combination of tempo runs and what I guess people call METCON work (metabolic conditioning). A tempo run for me is a short (20 minutes or less) run where I try to maintain a HR of less than ~80% and greater than ~70% of my max HR. In practice this is around 155-175. I’ve been struggling to find a pace that keeps me there, so during the 20 minutes I may have 8 minutes in total in that zone. I expect this will improve with practice and learning correct pacing. The METCON work (feel free to correct me on the term) is programmed at the end of my strength training sessions at home. I create rounds of easy-ish exercises that are designed to keep my heart rate very high for about 10 minutes. See the workout snapshot at the bottom of the post. I suppose this would also be called HIIT, or High Intensity Interval Training (Man oh man, our SEO is going through the roof on this one! I should probably reference Crossfit once or twice too, I’m basically WODing). I’ve programmed the blocks to follow what I think is called undulating load, where each of the first three weeks gets progressively harder. I accomplish this either through adding volume (more time running, more sets lifting, more reps, etc) or adding intensity (more weight, faster pace, etc.). 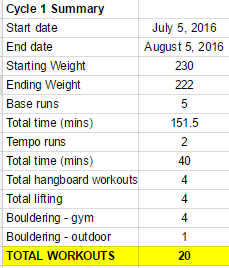 The fourth week is a deload, or kind of an off week where maybe I’ll do some light bouldering or a very easy run. The next cycle will pick up somewhere in the middle of the volume and intensity of the previous cycle. Through 3 weeks of progressive overload, I’ll theoretically reach a new peak at the end of the 2nd cycle. I’ll continue this for 3 months or so, take a real break, then re-evaluate. The trick is to never go that hard in any particular workout so that I’m ready for the next day. I’ll point out that I’m counting the hangboard workouts as separate but I do them concurrently with lifting or after a run, so my actual workout days are closer to 15 or 16 over 3 1/2 weeks. Even within those workouts, I program them so I do the hangboard workouts early so that I don’t fatigue my grip with kettlebell swings, which come towards the end. AMRAP means ‘as many rounds as possible.’ I actually finished the 2 rounds in ~10:15, not 10 minutes. So, that’s the new plan in a nutshell. I’m going to ride this out for at least 3 months and see where I’m at. It may not sound like it but this plan is much easier to manage from a time and planning standpoint and is much less mentally stressful. Instead of stressing out over needing to do a hangboard workout on a particular night, I do what my schedule allows and adjust accordingly as the week goes on. The important question is, is all of this working making me a better climber? The weather here has been too warm for me to get out, so I can’t say for sure. Time will tell. Other comments are that I’m still fat at 222 so continue to leave obvious gains on the table (but not food on the table, amirite?!?!). I’ll likely post these monthly summaries at the end of every block to keep myself on track. Feel free to critique! Sounds very interesting Matt. Total body conditioning is likely a good way to go. I say go for the Tetons – lots of real mountaineering there, or Chamonix. Dave! What’s up man, you around this winter? Hey Matt – just in Saskatchewan touring the Drop Zone road show. Definitely around this winter and anticipating some ice.